This study aims to prepare Eri Silk Fibroin (SF) solution and construct of its film. The Eri cocoons were firstly removed of sericin and then dissolved by 6 M Ca(NO3)2. The SF solution was dialyzed before measurement of silk percentage by weight. The solvate protein was then taken to prepare of SF film using 0.5 and 1% weight. The 10 mL of SF solution was cast on the polystyrene plates, left in room temperature for 2 days. The obtained SF films were then observed under Scanning Electron Microscope (SEM) and Fourier transform infrared spectroscopy (FTIR) for morphological and conformational studies, respectively. The results found that Eri SF films were rougher surfaces than Bombyx mori (B. mori) SF film. In addition, the film of 0.5% weight SF solution was also rougher surfaces than 1% weight. It contained the α-helix structure in higher ratio than 1% weight film since the 1% weight SF solution film composed in higher β-sheet structure. However, the later conformation could affect the SF film to be more hard and brittle than low percent weight content. Y. Srisuwan, N. Narkkong and P. Srihanam, 2009. Characterization on Eri (Philosamia ricini) Fibroin Film: Morphology, Structure and Thermal Properties. Journal of Biological Sciences, 9: 499-503. Natural polymers have been widely interested for applications. The naturally derived polymers that attractive to apply are chitosan, collagen and silk (Drury and Mooney, 2003; Altman et al., 2003; Croce et al., 2004). In addition, they were important sources for development of biological technology, especially medical application (Meinel et al., 2005). They should be according to the unique characteristics of them including non-toxicity (Meinel et al., 2005), biodegradability (Min et al., 2004) and biological compatibility (Kweon et al., 2001; Kim et al., 2005). Silk is a natural fiber spun by different types of insects, especially silkworm (Jin et al., 2002). Generally, silk was divided into 2 groups i.e., mulberry or domesticated silk (as well known Bombyx mori) and non-mulberry or wild silk. For B. mori, it has been studied and applied in textiles for a long history. In addition, it has been interested as major ingredient in cosmetic and food additive (Tao et al., 2007) as well as medical devices (Altman et al., 2003). Although, the material from nature has been explored wildly, however, the few of both types and quantity were still lower than those of synthetic polymers. Therefore, the new source of the natural polymer are required and gradually increased every year. Among the natural polymers, wild silk has been interested in study and application like the B. mori silk (Kweon et al., 2001). It is a remarkable type of the material for supplying or supplements the utilization of other polymers. Eri silk (Philosamia ricini) is a wild silk that has been cultured routinely in many countries, especially in China, India, Japan, Korea and Thailand (Mishra et al., 2003). Most of silk yarn production of Eri were used in textile and little of information for specific character both chemical and physical properties. The study on those of Eri properties is very interested to provide the general data of this silk. Therefore, this study aimed to prepare the Eri silk fibroin solution to use as a substrate for casting the silk fibroin films with different silk concentrations. The morphology, secondary structure and thermal properties were investigated. In addition, B. mori silk fibroin films were also studied for comparison. The data would be used to assess the possibility of the Eri silk for further applications. This study was constructed for 6 months from August 10, 2008 to January 10, 2009. All of Eri SF film preparation was performed at Room 406 and thermogravimetric analysis was determined at Room 404, SC 1 building, Department of Chemistry, Faculty of Science. Examination of conformational structure by FT-IR was done at Central Instrument, Faculty of Science, Mahasarakham University, Thailand. Materials: Both domesticated (B. mori) and Eri (P. recini) silk cocoons were kindly supplied from Silk Innovation Center (SIC) Mahasarakham University, Thailand. Those of chemical and reagents in analytical grade were used. Preparation of silk fibroin solution: The strips of degummed cocoons (10 g) both B. mori and Eri silk were placed in 100 mL solution of CaCl2/Ethanol/H2O (1:2:8 mole ratios) and 10 M melted Ca(NO3)2, respectively, stirred to dissolve at 90-100°C for 45-60 min. The obtained solutions were cooled, dialyzed in cellulose tube against distilled water for 3 days to obtain the regenerated SF solutions. 5.0% (w/w) of B. mori and 0.5% (w/w) Eri of SF solution was. The obtained Eri solution was obtained, then concentrated to 3% (w/w) by evaporating water slowly at 15± 2°C. Preparation of silk fibroin films: The 10 mL obtained SF solution with 0.5 and 1.0% (w/w) for Eri silk and 1.0% (w/w) for B. mori were separately stirred and then cast on the 5 cm diameters polystyrene plates. The plates were left air dried at room temperature for about 2-3 days. Finally, the films with a thickness about 30-45 μm were obtained. Morphological characterization: The films of SF both Eri and B. mori were mounted on the stub with double-sided carbon tapes, then sputter coated with gold. Current and voltage were adjusted to give power of 2 W (3 mA, 10 kV) for 3 min. The samples were examined using scanning electron microscope (SEM, JEOL-JSM 6460LV). Structural investigation: The SF films were analyzed for their structure with Fourier transform infrared spectroscopy (FTIR, Perkin Elmer-Spectrum Gx) in the spectral range of 4000-400 cm-1 at 4 cm-1 spectral resolution and 32 scans. FTIR was used to measure the absorption bands which represented the silk structure. Thermal behaviour analysis: A TA-Instrument TG SDT Q600 thermogravimetric analyzer was used to determine the thermal decomposition pattern of the silk films. The analysis condition was 50-1000°C for heating sample at 20°C min-1 rates under nitrogen atmosphere. Solubility of the silk fibroin: Eri SF could not be dissolved in CaCl2/Ethanol/H2O (1:2:8 mole ratios), while B. mori could.However, it could be successfully dissolved by 10 M melted Ca(NO3)2 at 90-100°C. Figure 1 showed the solubility of the SF both Eri and B. mori. The results found that the Eri and B. mori could be dissolved very well and used in similar time for dissolving. Therefore, those solutions used in this study were accepted. General morphology: The morphological texture of the Eri SF film has been rarely published, except for Antheraea silk, especially A. pernyi. The SEM micrographs of the SF films both Eri and B. mori could be shown in Fig. 2a-c. They indicate that Eri SF films have rougher of their surfaces than the B. mori SF film. Molecular analysis: From the Fig. 3, the absorption bands of B. mori SF film occur at 1653 cm-1 (amide I; α-helix), 1559 and 1520 cm-1 (amide I; α-helix and β-sheet), indicating that the main molecular conformations are both α-helix and β-sheet structure. The amide I band of the 0.5% (w/w) Eri SF film (Fig. 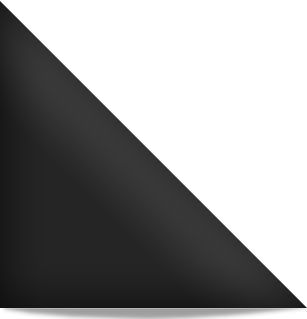 3) strongly shown at 1653 cm-1(amide I; α-helix), 1559 and 1525 cm-1 (amide I; α-helix and β-sheet) similar to the B. mori film. However, the strong band at 1235 cm-1 (amide III), which is the characteristic absorption band of β-sheet structure. 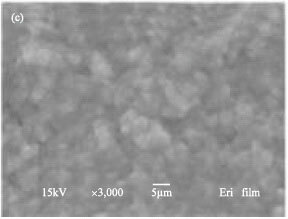 It promises large quantity of β-sheet structure inside Eri SF film. FT-IR spectrum of the 1% (w/w) Eri SF film (Fig. 3) has intense absorption at 1635 cm-1 (amide I; β-sheet), 1544 and 1525 cm-1 (amide II; α-helix and β-sheet, respectively) and 1238 cm-1, distributed to β-sheet structure. Thermogravimetry: Thermogravimetric curves of SF films are shown in Fig. 4. The results showed that the initial weight loss at around 100°C was the evaporation of water. All of SF films showed similar of their decomposition profiles even on different contents of the weight used for preparation of the Eri films. In order to observe the thermal behaviour, differential thermogravimetric (DTG) curves were shown in Fig. 5. The maximum temperature of the B. mori appeared at approximately 312°C. On the other hand, Eri films both 0.5 and 1.0% (w/w) showed strong peaks at 311°C. The condition used for preparation the Eri SF solution in this study was practically used thats mean the temperature and time for dissolving of silk fibroin were 90-100°C and 45 min, respectively. Otherwise, to promote the dissolution of the SF, they would be treated with ultrasonic since it has been reported that the ultrasonic treatment promotes the solvent to diffuse into the interior of SF fibers and speeds up the dissolution velocity (Tao et al., 2007). Observation of the SF film surfaces found difference between the film prepared from B. mori and Eri silk. These could suggest that the amino acid compositions as well as structural arrangement of the silk variety between Eri and B. mori silks are different (Tao et al., 2007). From the result it might be related to those of some properties such as secondary structure and thermal properties. FT-IR is very sensitive tool to analyze the molecular conformation of the SF film. Generally, the FT-IR spectra of protein are indicated by the peaks of amide I (1700-1600 cm-1) and amide II (1600-1500 cm-1) bands and amide III (1300-1200 cm-1) (Kweon et al., 2000; Hino et al., 2003). By the previously reported, α-helix absorption bands were around 1655 cm-1 (amide I; C = O stretching), 1550 cm-1 (amide II; NH2 stretching) and β-absorption bands around 1630 (amide I), 1520 (amide II) and 1240 cm-1 (amide III) (Tao et al., 2007; Kweon et al., 2001). From the FT-IR results, the major structure of the Eri SF film is β-sheet structure. Moreover, the Eri SF film prepared from 1% (w/w) existed structure is stronger than that of the film prepared from 0.5% (w/w). The results suggest that high protein contents would be enhanced the adjacent molecules to form inter-molecular bonds together, especially hydrogen bond. All of SF films were similar of C-O stretching (~1068) bands (Kweon et al., 2001). The FT-IR spectra revealed that the Eri SF film strongly appeared with stable profiles of absorption bands contrasted to B. mori. According to the earlier report, SF film of wild silks is partly rich in α-helical structure than those of B. mori. It is promising the Eri SF film stronger mechanical properties than B. mori. The maximum decomposition temperatures of those studied SF films were similar. These indicate that the protein content will not affect to thermal properties. However, the Eri SF films showed little shoulder peaks for the decomposition of each component, indications that Eri silk takes place through two steps of weight loss. The results were in ranged comparison to previously report that the maximum tolerance of the B. mori was 280-308°C whereas wild silk (A. pernyi and other belonging to the family Saturniidae) takes place for thermal decomposition underwent several steps (Zhang et al., 2002). The B. mori and Eri silk are different components which are affected to the overview properties including morphology, internal structure or thermal properties. The characteristics of each silk were depended on the silk variety as well as other environmental such as food or habitat. This study confirmed that both B. mori and Eri silk fibroin films composed of different characteristics. In addition, the difference effect is according from the content of the protein used to silk film preparation even the same silk species. We would like to thank Silk Innovation Center, Mahasarakham University for kindly supplied of silk cocoons, Central Instrument Unit and Chemistry Department, Faculty of Science, Mahasarakham University for conveniences analysis facilities. In addition, we gratefully acknowledge the Center of Excellence for Innovation in Chemistry (PERCH-CIC), Commission on Higher Education, Ministry of Education, Thailand for financial support. Altman, G.H., F. Diaz, C. Jakuba, T. Calabro and R.L. Horan et al., 2003. Silk-based biomaterials. Biomaterials, 24: 401-416. Croce, M.A., S. Chiara, G. Deanna, C. Elena, B. Federica and T. Roberta, 2004. Adhesion and proliferation of human dermal fibroblasts on collagen matrix. J. Biomater. Appl., 18: 209-222. Drury, J.L. and D.J. Mooney, 2003. Hydrogels for tissue ngineering: Scaffold design variables and applications. Biomaterials, 24: 4337-4351. Hino, T., M. Tanimoto and S. Shimabayashi, 2003. Change in secondary structure of silk fibroin during preparation of its microspheres by spray-drying and exposure to humid atmosphere. J. Colloid Interface Sci., 266: 68-73. Jin, H.J., S.V. Fridrikh, G.C. Rutledge and D.L. Kaplan, 2002. Electrospinning Bombyx mori silk with poly (ethylene oxide). Biomacromolecules, 3: 1233-1239. Kim, U.J., J. Park, H.J. Kim, M. Wada and D.L. Kaplan, 2005. Three-dimensional aqueous-derived biomaterial scaffolds from silk fibroin. Biomaterials, 26: 2775-2785. Kweon, H.Y., I.C. Um and Y.H. Park, 2000. Thermal behavior of regenerated Antheraea pernyi silk fibroin film treated with aqueous methanol. Polymer, 41: 7361-7367. Kweon, H.Y., I.C. Um and Y.H. Park, 2001. Structural and thermal characteristics of Antheraea pernyi silk fibroin-chitosan blend film. Polymer, 42: 6651-6656. Meinel, L., S. Hofmann, V. Karageorgiou, C. Kirker-Head and J. McCool et al., 2005. The inflammatory responses to silk films in vitro and in vivo. Biomaterials, 26: 147-155. Min, B.M., G. Lee, S.H. Kim, Y.S. Nam, Y.S. Lee and W.H. Park, 2004. Electrospinning of silk fibroin nanofibers and its effect on the adhesion and spreading of normal human keratinocytes and fibroblasts in vitro. Biomaterials, 25: 1289-1297. Mishra, N., N.C. Hazarika, K. Narain and J. Mahanta, 2003. Nutritive value of non-mulberry and mulberry silkworm pupae and consumption pattern in Assam, India. Nutr. Res., 23: 1303-1311. Tao, W., M. Li and C. Zhao, 2007. Structure and properties of regenerated Antheraea pernyi silk fibroin in aqueous solution. Int. J. Biol. Macromol., 40: 472-478. Zhang, H., J. Magoshi, M. Becker, J.Y. Chen and R. Matsunaga, 2002. Thermal properties of Bombyx mori silk fibers. J. Applied Polymer Sci., 86: 1817-1820.